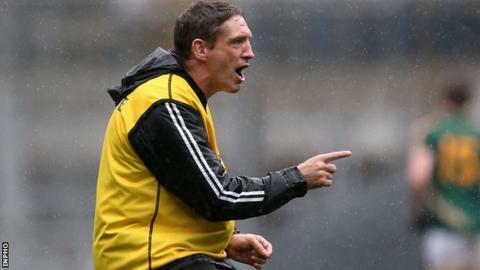 Kieran McGeeney has been confirmed as the new Armagh football manager by the county's GAA board. The Armagh All-Ireland winning captain, who was assistant to Paul Grimley this year, has been handed a five-year term. McGeeney, 42, was seen as a natural successor to Grimley following his appointment to the county backroom team last October. Kilcoo club manager Jim McCorry is reported to be in the frame to become McGeeney's number two with Armagh. The former Armagh defender, who has also been linked with the vacant Down job, told the Irish News that McGeeney and himself would be "a good partnership". An Armagh board statement on Wednesday night said that McGeeney's appointment had been unanimously ratified. "The county board would like to express our best wishes to Kieran, his backroom team and to our senior team as they continue to build on their recent progress," added the statement. Armagh were surprise All-Ireland quarter-finalists this season after making steady progress during the summer and only lost by one point against Donegal in the last-eight clash. McGeeney was manager of Kildare for six years with the failure to win a Leinster title or reach an All-Ireland final eventually leading to his departure in September last year. He did however reach four All-Ireland quarter-finals and a semi-final in 2010, when they lost to Down. A year later Kildare lost out to Donegal in extra-time at the quarter-final stage and McGeeney's men went on to win the Division Two title in 2012. The inspirational McGeeney captained the Armagh team when they won the All Ireland title in 2002. The Mullaghbawn native won six Ulster titles during his 15-year playing career and also represented and captained Ireland in the International Rules series.